All across America, young people with sharp minds and a strong determination to live are being forced to do so in a chronic hospital where they are warehoused in their bed. 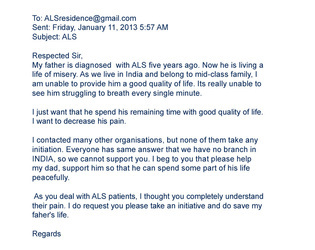 Their only crime is receiving an awful diagnosis like ALS. It is common that the paralyzed are left in bed 24/7. They never get a shower or go outside. They are left in painful positions and with no way to communicate. In fact, less than 10% of pALS choose to use a ventilator to extend their lives ultimately because they prefer death to the possibility of living such a life. 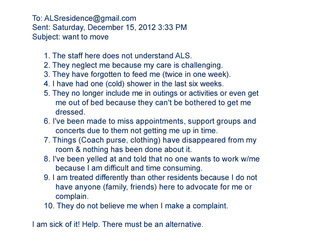 The ALS Residences prove that it doesn't have to be that way. It takes a commitment to making a profound difference in someone's life. Research for a treatment or cure remains the primary objective for pALS but no longer can we ignore that in over 140 years since ALS was first diagnosed, there exists no medicine that alters the course of the disease. Only technology has done that. 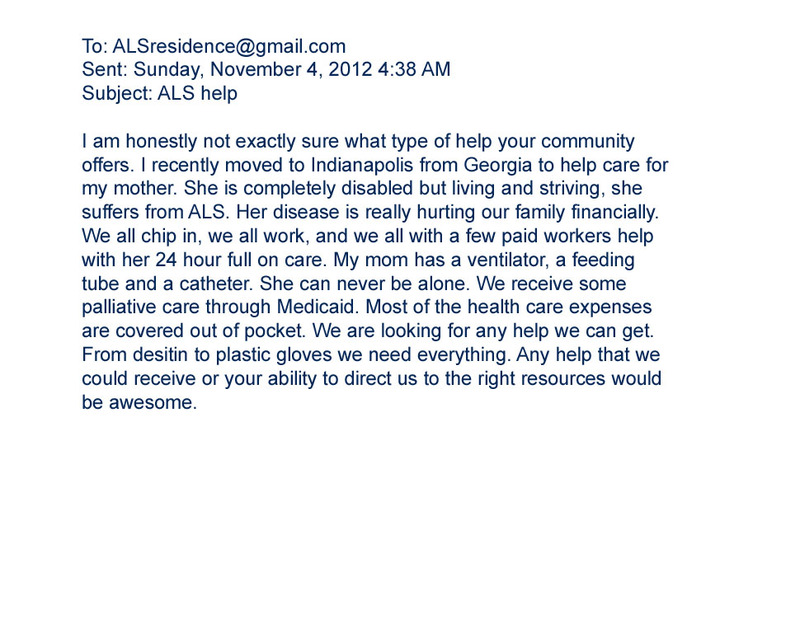 The ALS Residence is the logical 21st century solution to a problem that defies medical understanding. Until medicine proves otherwise, technology IS the cure. Become an ALSRI Advocate today. More specifically, it is the lack of options that leads most pALS to choose death when forced to choose between suffocation and getting a tracheotomy and living the rest of their life using mechanical ventilation to breathe. The financial and emotional burden of providing 24/7 care at home is overwhelming for most families. It is not uncommon for pALS to be forced to move to another State to receive marginal care from caregivers who don't understand that pALS remain mentally sharp inside a shell of a body. 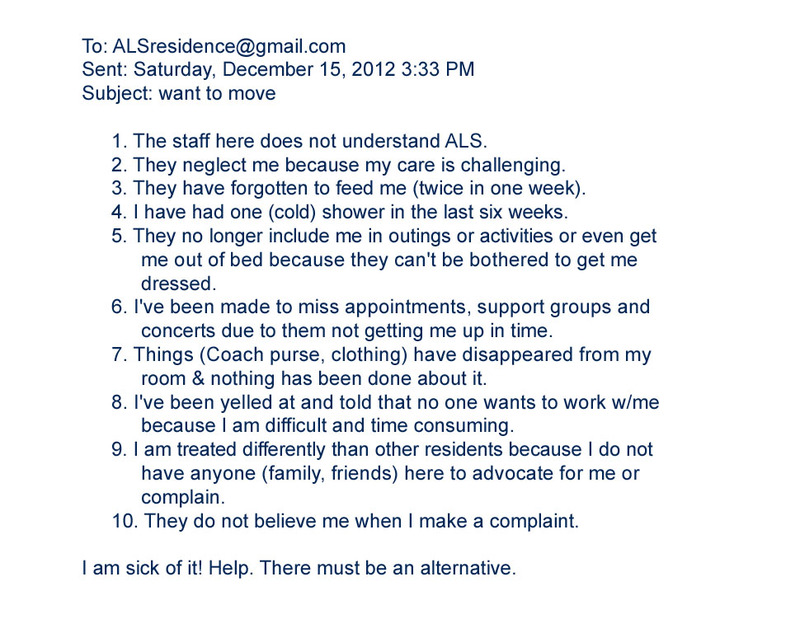 Click the thumbnails below to read actual emails received by ALSresidence@gmail.com. These people do not have any options currently. 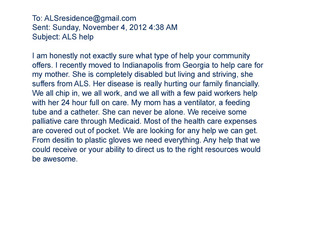 It doesn't have to be that way and that is WHY it is critical that the ALS Residence multiply across the country. 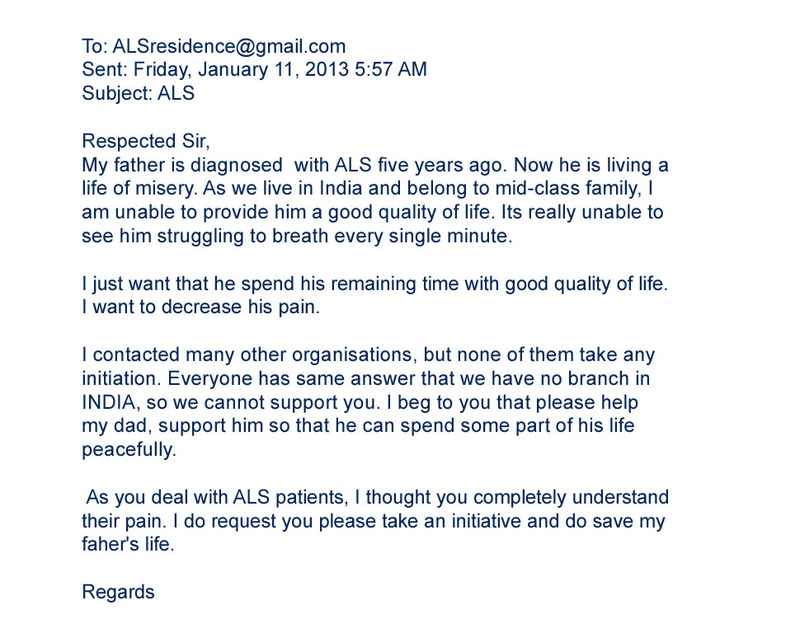 Register as an ALSRI Advocate today to join the effort to open an ALS Residence near you.